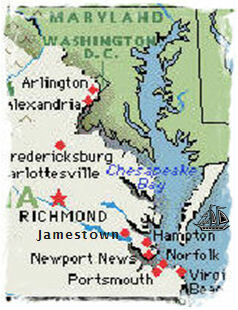 The 2010 annual meeting of the CFA was September 16-18 in Hampton, Virginia. This meeting was three days instead of the usual two because of special events planned to celebrate the 400th anniversary of the arrival in Virginia of John Chandler born 1600. The ancestor of many CFA members, John Chandler came to Jamestown in 1610 at the age of 9. As an adult, he owned thousands of acres of property and made his home in what is now Hampton. Please alert Eileen at if you have problems accessing the links below. The photos posted at Snapfish can be viewed one at a time or as slideshows. You may also order prints. Sharon Maloney and Claudia Brocato contributed these photos. Video (39 seconds) by Jim Light at Fort Monroe (known to the English settlers as Point Comfort). Video (13 seconds) by Jim Light from Fort Monroe looking toward Fort Wool. These two fortifications historically worked together to protect Hampton Roads (one of the world’s great harbors) from seafaring threats. Video (47 seconds) by Jim Light of the monument commemorating the landing of the English near this location in 1607 before proceeding to Jamestown. The monument is located on the grounds of a Veterans Hospital overlooking Hampton Roads.